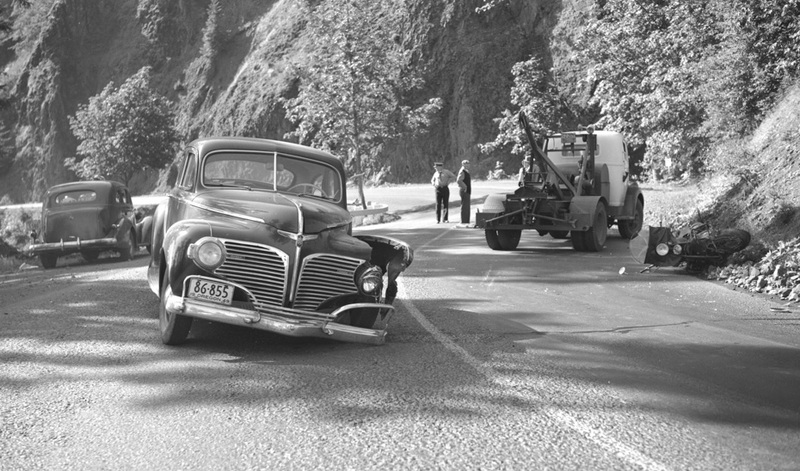 As cars became larger and faster the Columbia River Highway became more and more dangerous. This collision between a Dodge automobile and a motorcycle in 1949 had very sad results. Accidents like this spurred on the development of the new highway near river level. The old highway was not built for speed. Used to take forever to get from Hood River to Portland and we kids considered it a real days outing when we went. If those cars wouldn't have been in the way, that would have been a fun motorcycle run back in the day. Had a Harley when I worked at the tie mill at Cooks and lived in Portland, really enjoyed the curves of the old highway, especially at night with no traffic. I never rode that road without getting car sick & we used often!